Having a family camping or Sitting around an open fire, perhaps a bonfire at the beach at nighttime, or possibly in the woods, or maybe you have a fire on your drive way in a hubcap, and you find yourself appreciating the view of the flames and the warmness, but something is missing. A roasted marshmallow! Start by building a fire, you can start with tinder e.g. papers, which happen to be the most important in starting a fire, and then continue adding on bigger and bigger pieces of dry wood. Get your Marshmallow Sticks Campfire BBQ roasting fork with bamboo skewers tip and also with an extendable 32 inches length. It enables you to turn marshmallows or hot dog for even browning just with the twist of your fingers. Poke a marshmallow onto the stick. Be sure that the tip of the stainless steel passes through the other end of the marshmallow to protect it against slipping off, when things start getting hot. It is possible to stack more marshmallows as you can fit onto the stick. Although to achieve toasted ends you will basically need to do it one after the other. Extend the marshmallow to remain in or above the fire. Placing a marshmallow into leaping flames will definitely set it on fire and burn it. In the event you burn it, you can still pick out the burnt areas and eat the soft, gooey inside. Keeping it over reduced coals will bring out a pleasant golden brown color. For best outcome, simply wait until the fire has burned long enough to generate hot coal spots. These spots provides oven like warmth without igniting your marshmallow. 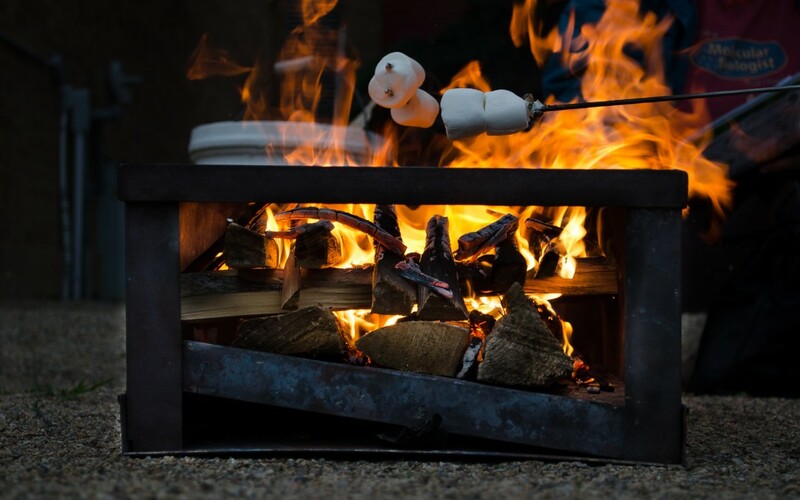 Rotate your Marshmallow roasting stick to gradually heat and toast the marshmallow. It is always amusing to see the way they puff up while roasting. One can roast until they are with a uniform golden color. Remove the marshmallow when it’s done to your prefer level and blow it if it caught fire. Do not shake the marshmallow. Let the marshmallow cool off for 30 seconds to one minute before trying to consume it. Burning your tongue can ruin your experience. The tip turns backwards towards the handle, which makes it has blunt harmless tip. The twin skewers keep the marshmallow turning always. The twin skewers also hold hot dogs and smores tightly. When you swing, the marshmallow or hot dog are pressed tight against the reverse curve of the steel which keeps them firm and does not enable them to roll off. 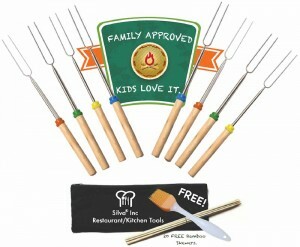 The skewers are perfectly in line with the stick handle so they usually stay positioned anywhere you want them.